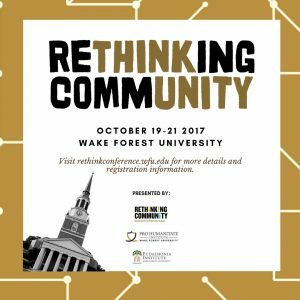 Inside WFU – news for faculty and staff | National leaders gathering at Wake Forest to "Rethink Community"
For three days in October, Wake Forest is bringing together national thought-leaders across the ideological spectrum to discuss what it means to live in a society that is more diverse, polarized, global and virtual than at any time in the past. Called the Rethinking Community Conference, it will take place Oct. 19-21. Registration details for the conference are available at its website. The website offers information on the conference schedule, dates and times of events, as well as locations. Hosted by the Eudaimonia Institute and the Pro Humanitate Institute, the conference will feature timely discussions about free speech and safe spaces, the fight to end or defend DACA, a conversation about free press and fake news, and the powerful interplay of politics and sports today. Journalists, politicians, scholars and public intellectuals will participate in the discussions. A University news release about the conference is available here. A separate news release focuses on a conference panel discussion that will explore the role of sports in community and address related tensions.